Bienvenue! Join me as I explore the culture and language in the Provence-Alpes-Côte d'Azur region of France. Bonjour from Paris! One of the many wonderful things about my study abroad program this semester is that it begins with a two-week orientation session in Paris, France! The purpose of this orientation is to get oriented to living in France and to get to know the 13 other program participants before settling into Aix and beginning classes for the semester. It is also a great way to spend the remainder of my winter break! After a long day of traveling, in which I flew from Boston to New York to Charles-de-Gaulle Airport in Paris, I arrived in Paris early in the morning (Paris time) on December 28. Our Paris orientation director, Madame Egron-Sparrow (Program Director and French professor at Wellesley College) met us at the airport and brought us to our hotel. After a few words, we all retired to our rooms for some much needed rest. Since this was my first time traveling internationally, this was also the first time that I have experienced jetlag! The 6-hour time difference between France and the US, along with the fatigue associated with traveling made me extremely exhausted! I had planned on just sleeping for a few hours and then exploring Paris a bit in the early afternoon, but I ended up sleeping until 4pm on the first day! Catching up on sleep was definitely worth it though! After a brief orientation meeting, I spent the evening exploring Paris with the other program participants. We grabbed some dinner and then went to the Centre Pompidou, which is basically a huge and modern complex in the 4th arrondissement that houses a modern art museum, a library, a music research center, and much more! I had such a blast seeing Paris at night for the first time...it was unlike anything I had every experienced before! So jetlag still got the best of me today, but I didn't let that ruin my day! After sleeping in late again (not as bad as yesterday though! ), my roommate Sierra and our friend Nicole (both Wellesley students) decided to go visit the market and explore the area near our hotel. I also visited my first boulangerie today (bread store) and ate my first "official" croissant. Needless to say, it was delicious! And I am already addicted...but c'est la vie! In the afternoon, we visited the l'Ile de la Cité and the Latin Quarter. This area surrounds the Seine River and is absolutely beautiful! 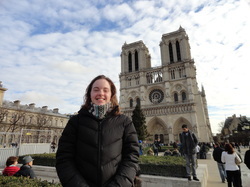 I caught my first glimpses of famous sites such as the Notre-Dame Cathedral and the Louvre. I believe that this is the moment I fell in love with Paris ;) But really, it was absolutely beautiful! We were even able to go on the Bateaux-Mouches afterward, which ride down the Seine River and show all of the sites surrounding the river. Today began with the search for the "Meilleure Baguette de Paris," also known as the best baguette in Paris! There is a competition every year in Paris, and the winner for 2013 was the boulangerie called "Au Paradis de Gourmand." After struggling to find the place, we all bought sandwiches with the famous baguettes. They were really good...but I don't know if I would call them the best baguettes. But I'm not really picky...I seem to like all baguettes that I eat, which is a minor problem, but oh well! Afterward, we decided to visit Montmartre, which is where the famous Sacre Coeur Basilica is located. The basilica is situated on the top of a huge hill, so the views from the church were incredible! Although it was a very rainy day, I really enjoyed being able to look out over all of Paris! In the morning, we visited Les Passages Couverts, which are a series of unique covered passages in Paris that house a variety of shops and restaurants. The architecture and historical significance of these passages was incredible. Afterward, we visited the Musée du Chocolat, which is just what it sounds like - a Chocolate Museum! Here we learned about the origins of chocolate, the history of chocolate specifically for France, and drank special hot chocolate! In the evening, we went to a musical called 1789, Les Amants de la Bastille. This musical was about the French Revolution. Although it was near impossible to understand a lot of what the characters were saying, because they often spoke quickly and sang, I really enjoyed the music and theatricality! Since the musical finished close to midnight and it was New Year's Eve, we celebrated the New Year on the métro on the way back to our hotel. It was pretty cool to realize that I was celebrating the new year in a foreign country - a year of change, experience, and personal growth for me. We actually took a 2-day break from Paris and made a trip to the northwest region of France, known as Normandie. 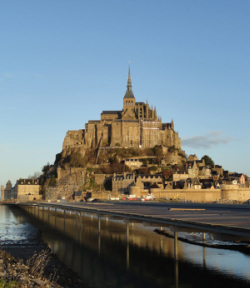 Here, we visited Mont Saint-Michel, which is an island that has served a variety of purposes since its founding in the 8th century - defense post, prison, and monastery. The history in this place was incredible, and the views from the cathedral were amazing! For lunch, I ate a traditional normandie crêpe with ham and goat cheese. It was delicious! Later in the afternoon, we traveled to Colleville to visit the Normandy American Cemetery that memorializes American soldiers who fought/died on the D-Day beaches during WWII. The memorial was very impressive, and I was humbled to see the beaches where so many American soldiers had given their lives to protect our country and the world. We headed back to Paris later that evening. It was nice to escape Paris for a few days for some rest and relaxation, but I was ready to get back and explore more in Paris! After spending a few days in the quieter part of France, it felt really good to return to Paris for a second week of adventures! Today was a complete "touristy" day for me. I explored the Louvre and visited the Eiffel Tower and the Arc de Triomphe. The day began with a tour of the Louvre with our art historian guide, Lucile Stellakis. We learned about the architecture and history of the museum and saw many of the most well-known paintings at the museum. Some highlights of the tour include: The Sphinx, La Vénus de Milo, The Mona Lisa, and the apartment of Napoleon III. I was surprised at how small the Mona Lisa actually was, but I was amazed to be in the presence of such a celebrated piece of art. My favorite part of the museum tour was actually Napoleon III's apartment. The decorations were very ornate, and the portraits were very realistic. It was a really unique experience. In the evening, I decided to finally take a trip to visit the Eiffel Tower and the Arc de Triomphe. The Eiffel Tower was a lot bigger than I had imagined it would be, and it was so bright! Unfortunately, I was not able to take the elevator to the top of the tower because it was too windy that evening, but that's okay! I will just have to return to Paris another time to do that then! Afterward, I visited the Arc de Triomphe, which is situated at the Place Charles de Gaulle at the entrance to the famous Champs-Elysées. I was very happy to be able to visit both of these celebrated sites in Paris! Today I visited one of the secret jewels of Paris, the Musée de Camondo. This museum is actually a mansion built in 1911 by the Comte Moïse de Camondo. It contains eighteenth century furniture and artwork. All of the rooms were gorgeously decorated. I found this museum to be amazing because it was really unique and unlike any other museum in Paris. Today was our first completely free day in Paris, and it was a Sunday, which means that a lot of places were closed for the day. So I decided today was the perfect opportunity to go to mass at the Notre Dame! I really enjoyed hearing the mass in French and getting to experience attending mass in such a gorgeous cathedral. I was impressed at how similar the mass was to masses in the US. I was able to follow along fairly well because I know the mass parts so well in English. After the mass, I explored the church a bit. I was so impressed with the architecture of the cathedral and the incredible stained glass windows. I spent a few hours enjoying the atmosphere of the church. It was so nice to have a day to finally be able to relax on my own. In the evening, I also went to visit the Saint-Sulpice church, which is located near the Luxembourg Gardens. This church is well-known for its role in Dan Brown's The DaVinci Code. Although it was much less grand than the Notre Dame, I really liked this church a lot. The stonework and ceiling murals throughout the church were very impressive. This weekend I went on a trip with my program to Nice to celebrate the beginning of Carnaval and to Menton to celebrate the Fête du Citron. We arrived in Nice, France on Saturday morning. Nice is located in the southeast of France along the Mediterranean Sea. It was the beginning of Carnaval in Nice, which is a festival that takes place every year about a month before Mardi Gras to serve as a last period of celebration before Lent begins. Before attending the Carnaval celebrations, I visited the Musée Chagall. Marc Chagall was a Russian-French artist during the 20th century that is known for his early modernist work. The museum was really well done, and I was impressed with many of his works. I also enjoyed seeing Chagall's beautiful stained glass windows. Afterward, we went to the parade of the Bataille de Fleurs, which translates to "Battle of the Flowers." We were really curious as to what this parade would entail given the name, and after seeing the parade, I am still not exactly sure how to classify the experience...let's just say there was some very interesting floats. But it was overall a really good experience! The best part was that the people on the floats threw gorgeous flowers into the crowd! It ended up becoming somewhat of a competition to see who could catch the most flowers. Towards the end of the parade, they started tearing down all of the flowers on the floats and throwing even more into the audience, which was wonderful! I ended up getting a huge bouquet of flowers from the parade (seen in picture). After the parade, we decided to get some gelato at a famous place in Nice called "Fenocchio's." I got raspberry, caramel, and chocolate gelato...it was delicious! Then we explored Vieux Nice for a bit, including the Place Garibaldi and the port. For dinner, we decided to eat at a well-known restaurant in Nice called "Chez Pipo." We ate socca, which is a specialty of Nice. It is a dish made of chickpea flour and olive oil - I LOVED IT!